In the legal battle between Apple and Samsung, the latter's fate rests on how much it can claim it never needed or wanted to plagiarize. But after reading memos like these, that's going to be very, very hard to buy. AllThingsD relays some highly humiliating internal documents recently squeezed out of Samsung in court—and they are an absolute nightmare for the company. 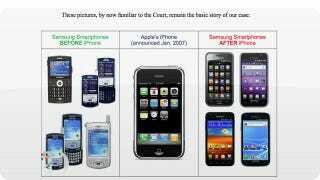 Publicly, Samsung says it never copied the iPhone. But from one exec to another? I hear things like this: Let's make something like the iPhone. When everybody (both consumers and the industry) talk about UX, they weigh it against the iPhone. The iPhone has become the standard. That's how things are already. Do you know how difficult the Omnia is to use? When you compare the 2007 version of the iPhone with our current Omnia, can you honestly say the Omnia is better? If you compare the UX with the iPhone, it's a difference between Heaven and Earth. Influential figures outside the company come across the iPhone, and they point out that "Samsung is dozing off."